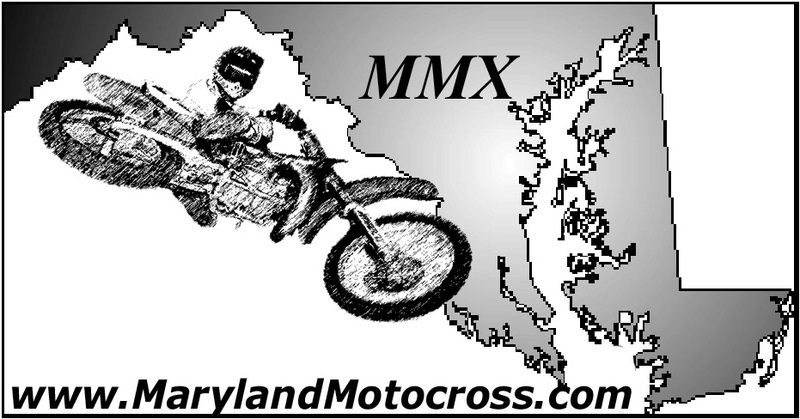 MarylandMotocross.com: Man how you gonna jump all up in my stuff and mess it up? I got it man. When I say I got it… (Blick up!) Oww Kev!... what... what’d you hit me with a frying pan or something, man that ______ hurts! Okay. Okay I’ll go over some stuff with him. MM.com (rubbing back of head): Hey Mr. Crine how are you doing today? -Kevin Crine: Doing good, doing well. MM.com: Nice, So what’s the story with your number? -KC: What’s the story with my number? Uhhh… I changed it back to 574 this year because it was the first Pro number I ever had. Back in 93 when I first started, that’s what I had. MM.com: I see, so that’s not your record of chicken nuggets eaten in one sitting? -KC: No. No. Nuh-uh. It’s not. MM.com: Oh, I just know you have a huge thing for chicken. So what type of bike do you ride and what brand of MX gear do you prefer? 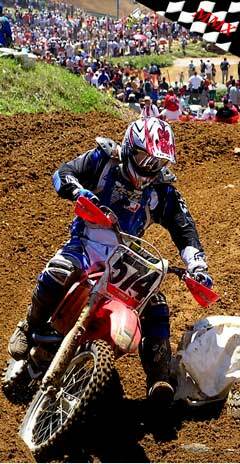 -KC: I ride CRF 450 and in local races I ride a CRF 250 and MSR gear. MM.com: Could you describe your average race weekend as a privateer? -KC: My average race weekend (laugh) Yeah – Hectic. That pretty much sums a lot up. It’s a lot of work. There’s a lot of prep all weekend long, getting ready for that weekend. Getting there, you know driving. 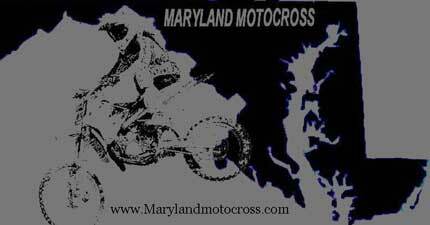 As a privateer, you’re driving, driving, driving, and once you get there, it’s time to go racing. As soon as you’re done, it’s driving all the way home. MM.com: I know that you train with Jeff Slusher, so can you confirm that his mom is raising a secret army of ninjas to run security at upcoming M.A.M.A events? -KC: (Laughing) Yeah. Yeah, she’s a wild one. MM.com: I saw on you resume’ that you have some expertise being an instructor at MX schools; care to comment on that experience and what you’ve learned from it? -KC: I learned a lot of things, but mostly I learned about kids. I really enjoyed working with them, it was always a great experience I had a lot of fun with it. That was the biggest thing. You always see your younger self in a lot of them, especially the ones that push and try really hard. It reminded me of my self sometimes. MM.com: How did you feel when you first turned Pro? -KC: Real good. I just had a good time with it. I never thought I was going to do it and then, uhh, I just kept riding and practicing, and it turned into it. I just pushed myself and kept riding, it became a part of me. MM.com: Sweet, didn’t you break the left Phalange’ on your bike this past weekend? -KC: (Laugh) Yeah and my power band too. MM.com: Where do you work and what is your role there? MM.com: Tell me about your racing in Germany? MM: Do you get a lot of support for motocross from your wife and other friends and family? -KC: I get a ton of support from the wife and family. They love it just as much, if not more than I do. It’s always good, they always got my back. Some days I didn’t feel like going and the wife was always behind me, telling me “Come on you gotta go,” or telling me “You know you want to go,” once I get there I’m usually in the mood to do it, so it’s always good to have that support. MM.com: If you could have the honor of meeting anyone alive or dead, who would it be? and you can’t say Captain M.
MM.com: Sure, Got any memorable injuries or pivotal learning experiences to share with your fans? -KC: (Laughing hard) Hah-Hah-Hah! Oh Lord, injuries. No. No injuries are ever a thing to remember, you know what I mean? You want to forget those. I’ve had my share. MM.com: Do you have any advice for anyone turning Pro or thinking about turning Pro? -KC: Have fun. Enjoy it. You gotta make it fun and just try hard. MM.com: If you were going to be stranded on a desert island, which would you want with you, Your Wife, your Dodge Van, or Han Solo? -KC: Let’s go with the wife. MM.com: Is there anything like that has changed or you’d like to see change in motocross? -KC: Definitely, I’d like to see the riders get paid what they deserve. That’s what I’d like to see. MM.com: And those guys who interview the rider too, right? -KC: Yeah you guys too. MM.com: Thank you very much for your time Mr. Crine, we know and appreciate that even though you’re pretty busy, you’re never too busy for your fans. So, good luck on the rest of your Outdoors Pro National Events. -KC: Thank you. Well my Pro Nationals are all over. 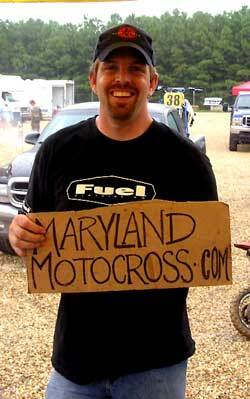 That was the last at Budd’s Creek I retired there. -KC: Yup. That was the last one. MM.com: You’re just going to stick with local? -KC: Yeah. I’m just going to play on the bike. Got a kid on the way here in the next 3-4 weeks, a little boy, so we’re just playing it by ear. MM.com: I’m glad that I got to see you race. You take care and we’re sad to see you retire.